CANADA 250 Dollars 2017 – Loup – 1 kg Argent 999 Proof (yeux émaillés) – 400 exemplaires seulement – diamètre 102,1 mm – prix 1639 euros. 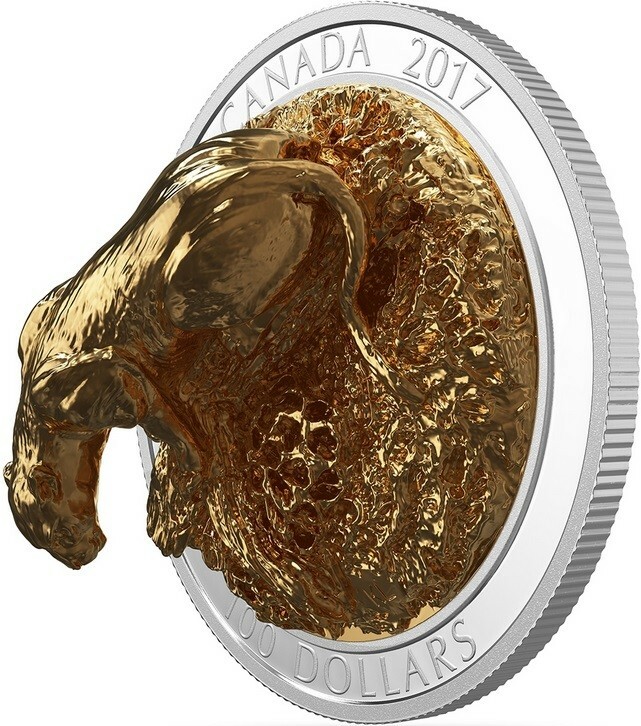 CANADA 250 Dollars 2017 – Timber Wolf – 1 kg 0.999 silver Proof (enameled eyes) – mintage 400 pcs only – diameter 102.1 mm – price $1,763. CANADA 10 Cents 2017 – Pièces de grande taille : 10 cents – 157,6 g Argent 999 Proof (partiellement plaqué or) – 2150 exemplaires – diamètre 65,25 mm – prix 398 euros. CANADA 10 Cents 2017 – Big Coins : 10 cents – 157.6 g 0.999 silver Proof (partially gold plated) – mintage 2,150 – diameter 65.25 mm – price $426. CANADA 20 Dollars 2017 – Avion de la seconde guerre mondiale : Avro Anson – 31,83 g Argent 999 Proof – 7500 exemplaires – diamètre 40 mm – prix 73 euros. 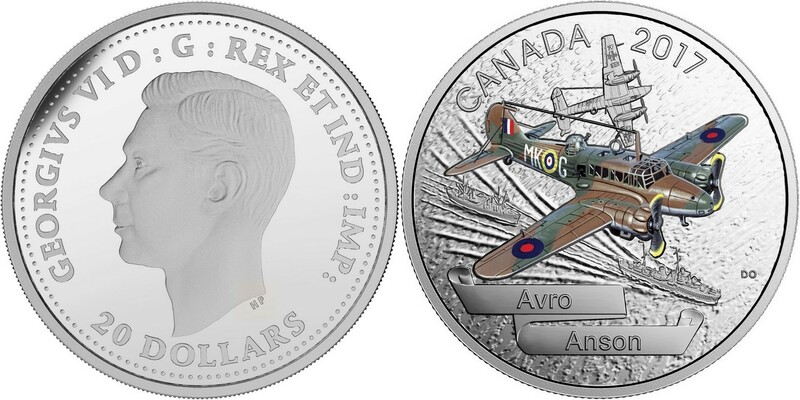 CANADA 20 Dollars 2017 – Aircraft of the Second World War : Avro Anson – 31.83 g 0.999 silver Proof – mintage 7,500 – diameter 40 mm- price $79. CANADA 20 Dollars 2017 – Kaleidoscope : le huard – 31,85 g Argent 999 Proof – 7500 exemplaires – diamètre 60 mm – prix 84 euros. 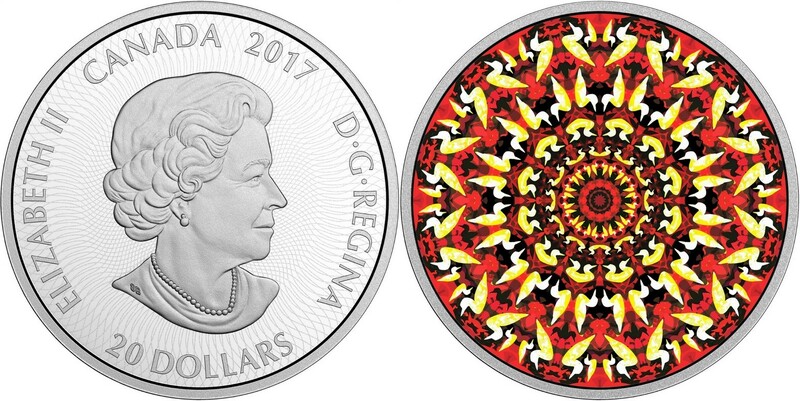 CANADA 20 Dollars 2017 – Kaleidoscope : The Loon – 31.85 g 0.999 silver Proof – mintage 7,500 – diameter 60 mm- price $90. CANADA 3 Dollars 2017 – Ode à l’amour – 7,96 g Argent 999 Proof (avec un cristal Swarovski) – 17 500 exemplaires – diamètre 27 mm – prix 39 euros. CANADA 3 Dollars 2017 – Celebration of Love – 7.96 g 0.999 silver Proof (with one Swarovski crystal) – mintage 17,500 – diameter 27 mm – price $42. CANADA 3 Dollars 2017 – Signes du zodiaque : Poissons – 7,96 g Argent 999 Proof (avec deux cristaux Swarovski) – 5500 exemplaires – diamètre 27 mm – prix 39 euros. CANADA 3 Dollars 2017 – Zodiac Signs : Pisces – 7.96 g 0.999 silver Proof (with two Swarovski crystals) – mintage 5,500 – diameter 27 mm – price $42. CANADA 10 Dollars 2017 – 150 ans du Canada : île Panmure – 15,87 g Argent 999 Proof – 25 000 exemplaires – diamètre 34 mm – prix 37 euros. CANADA 10 Dollars 2017 – Celebrating Canada’s 150th : Panmure Isl – 15.87 g 0.999 silver Proof – mintage 25,000 – diameter 34 mm – price $40. 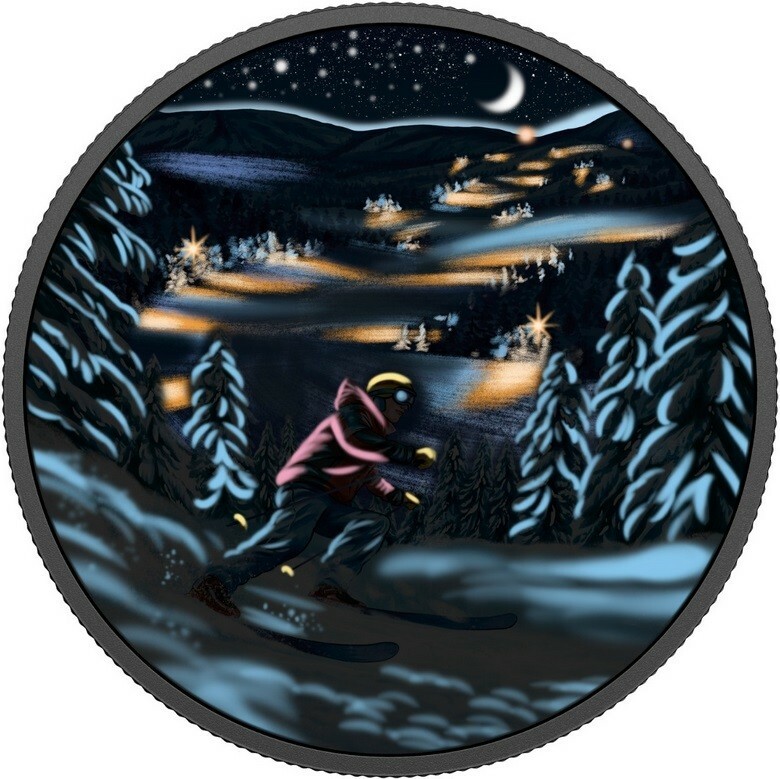 CANADA 15 Dollars 2017 – Ski nocturne – 23,17 g Argent 999 Proof (monnaie photoluminescente) – 15 000 exemplaires – diamètre 36,07 mm – prix 50 euros. 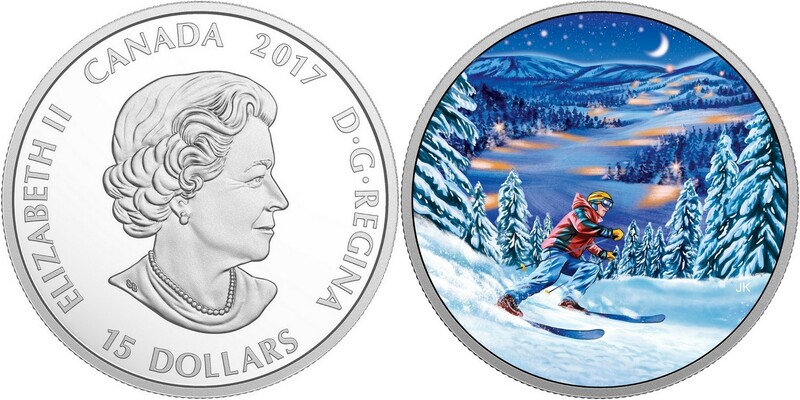 CANADA 15 Dollars 2017 – Night Skiing – 23.17 g 0.999 silver Proof (photoluminescent coin) – mintage 15,000 – diameter 36.07 mm – price $54. CANADA 10 Dollars 2017 – Randonnée en traîneau à chiens et aurore boréale – 15,87 g Argent 999 Proof – 15 000 exemplaires – diamètre 34 mm – prix 37 euros. CANADA 10 Dollars 2017 – Dog Sledding Under the Northern Lights– 15.87 g 0.999 silver Proof – mintage 15,000 – diameter 34 mm – price $40. CANADA 20 Dollars 2017 – Sterne arctique – 31,39 g Argent 999 Proof – 7500 exemplaires – diamètre 38 mm – prix 82 euros. CANADA 20 Dollars 2017 – Arctic Tern – 31.39 g 0.999 silver Proof – mintage 7,500 – diameter 38 mm – price $88. 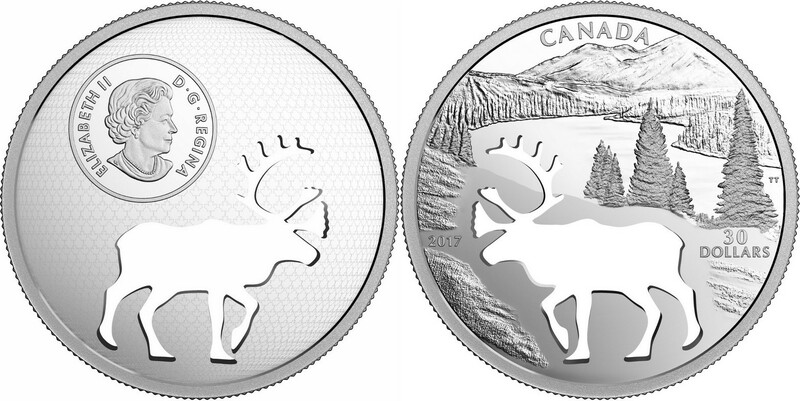 CANADA 30 Dollars 2017 – Caribou – 52,88 g Argent 999 Proof (silhouette découpée) – 5500 exemplaires – diamètre 54 mm – prix 135 euros. CANADA 30 Dollars 2017 – Woodland Caribou – 52.88 g 0.999 silver Proof (cutout animal) – mintage 5,500 – diameter 54 mm – price $146. 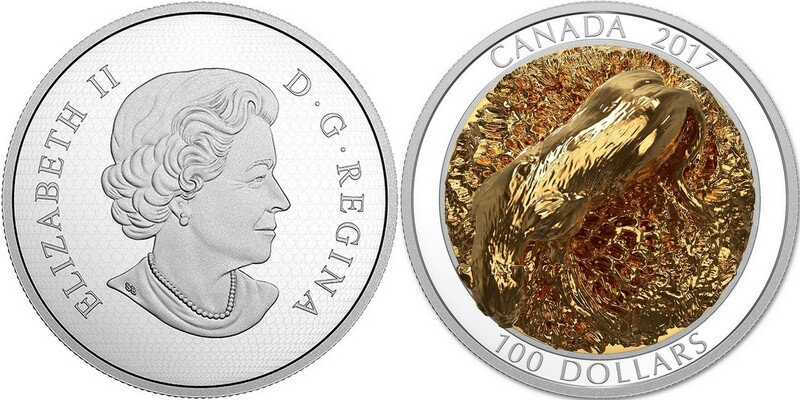 CANADA 100 Dollars 2017 – Sculpture d’animaux canadiens majestueux : Cougar – 315,71 g Argent 999 Proof (animal plaqué or) – 1200 exemplaires – diamètre 65 mm – prix 784 euros. 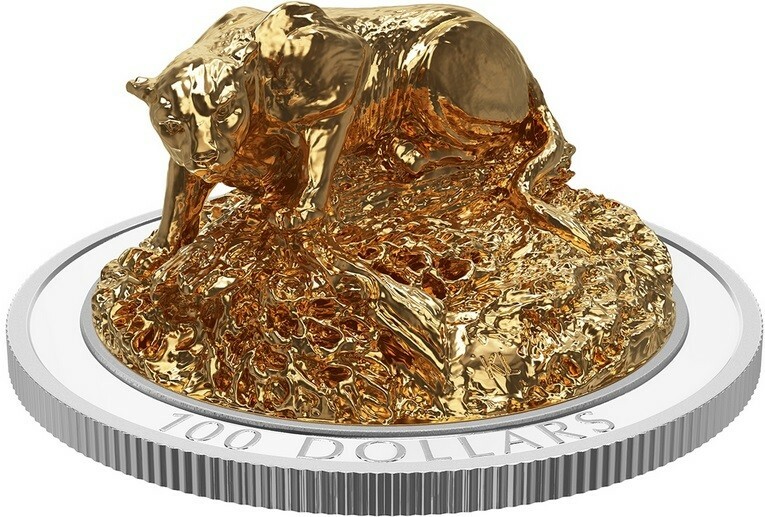 CANADA 100 Dollars 2017 – Sculpture of Majectic Canadian animals : Cougar – 315.71 g 0.999 silver Proof (gilded animal) – mintage 1,200 – diameter 65 mm – price $843. CANADA 20 Dollars 2017 – Oeuf Pysanka – 31,82 g Argent 999 Proof – 5000 exemplaires – taille 45 x 33 mm – prix 82 euros. 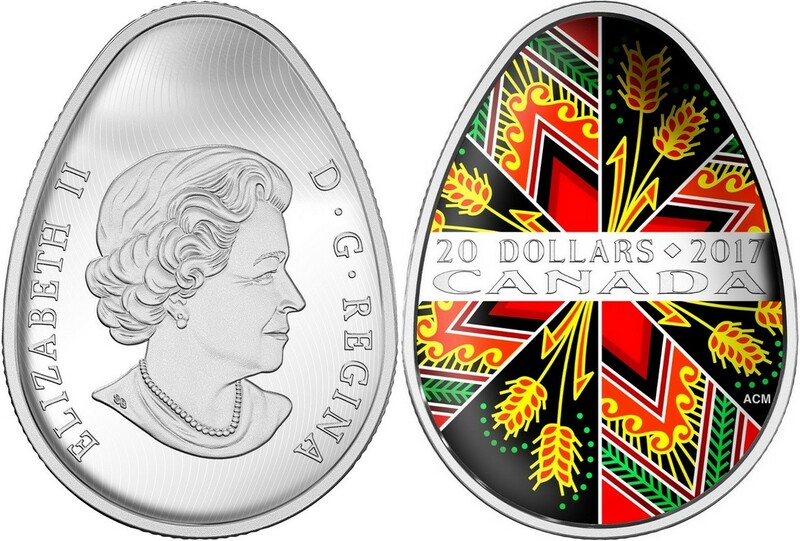 CANADA 20 Dollars 2017 – Pysanka Egg – 31.82 g 0.999 silver Proof – mintage 5,000 – size 45 x 33 mm – price $88.